Konami has announced it will release Metal Gear Solid: The Legacy Collection in North America and South America in June 2013. Celebrating the 25th anniversary of the franchise, this package will include Metal Gear Solid, Metal Gear Solid 2 HD, Metal Gear Solid 3 HD, Metal Gear Solid: Peace Walker HD, Metal Gear Solid: VR Missions and Metal Gear Solid 4. This essentially adds up to the Metal Gear Solid HD Collection with newly added MGS 1, MGS 4, and VR Missions. In addition, the collection will also include two Ashley Wood digital graphic novels. With more than 33 million units sold to date, the Metal Gear series has become a global phenomenon and is the seminal work of creator Hideo Kojima. The next chapter in the series is coming soon, as Metal Gear Solid 5. 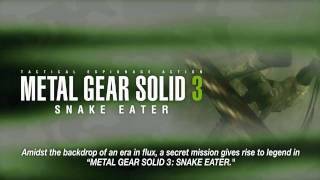 Metal Gear Solid: The Legacy Collection will be released on PlayStation 3. "One of the finest stealth franchises brought back to life"
Metal Gear Solid HD Collection is ranked #126 out of 1434 total reviewed games. It is ranked #26 out of 112 games reviewed in 2011.